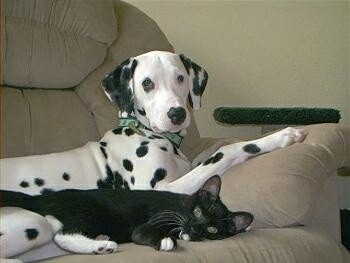 Two Dalmatians—Snickers is the black spotted male and Kandee is the brown spotted female. Snickers and Kandee, two Dalmatians all grown up—"Kandee, is the brown spotted (right), and on the left is Snickers, black spotted. They were both looking at a piece of chicken; I was wondering who will be the good dog who sits and acts nicely so he'd take the piece of chicken, and it was funny the way they both just sat down next to each other, giving the same reaction, which made me a little bit confused who would win. That actually forced me to make them a whole bowl full of chicken; I had to be fair lol." Don the Dalmatian puppy from India at about 3 months old—"Don loves to run in my canals and also likes to play with a ball. He also likes long jumps and biscuits. He dislikes medicine and strange people." Don the male Dalmatian puppy from India at 4 months old—"He likes his girlfriend named Ferry. He always looks at her over the wall. I think he says to all, "Love has no boundaries." Abby the Dalmatian out in the yard. 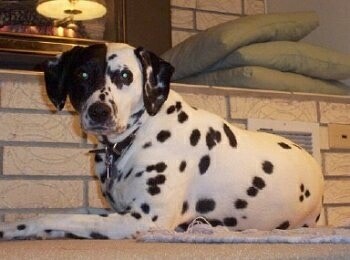 Dot the Dalmatian has a large black patch on her face.